The Hobbit's release is drawing near, but not fast enough for some of us. Experience in person some of the epic fantasy while we wait for the Hobbits to come back to the big screen. While most of The Hobbit's filming locations are undisclosed, we can still experience Middle Earth through The Lord of the Rings' filming locations. 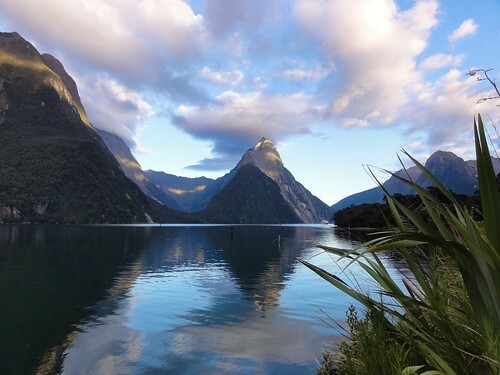 Take a campervan trip across the dramatic and diverse scenery in New Zealand that inspired Peter Jackson's masterpieces. Visit the deep hidden valleys, mystical mountain scenes, low, lush valleys and barren remote locations that become better known as Middle Earth. You may find yourself in luck if some or most of these locations doubled as filming locations for 'The Hobbit' also. Lets start at the top and work our way down the beautiful landscapes of New Zealand. Pick up a Campervan in Auckland and start your journey South. Find one for your journey through Middle Earth at Motorhome Republic. Your first stop is approximately 2 hours away in Matamata which coincidentally happens to be the first scene in LOTR - Hobbiton. Take the Hobbiton tour for approximately 2 and 1/2 hours from Matamata Information centre (45 Broadway, Matamata). The next destination is Mordor and Emyn Muil. Scenes involving Sauron's domain of Mordor were filmed in the rocky Plateau New Zealander's know as Tongariro National Park. Three active volcanoes Ngauruhoe, Tongariro and Ruapehu dominate the landscape where other middle earth characteristics such as sulphiric pools and hot springs also appear. 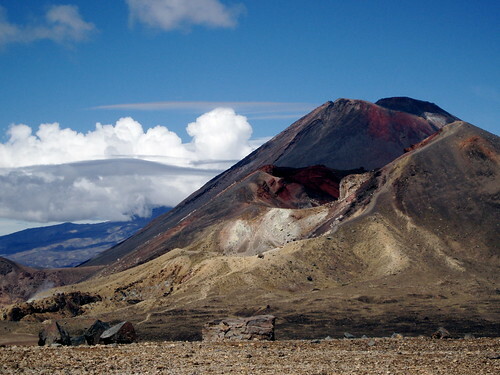 Orc scenes were filmed on the slopes near Pinnacle ridge and Mount Tongariro doubled as Mount Doom. Do a walk of the locations with a tour guide. Check out this one. Continue South through Middle Earth to what New Zealand knows as the Waitarere forest but what LOTR enthusiasts would associate the Trollshaw forest and Osgiliath Wood with. Take a walk through the forest that is situated on the Kapiti Coast of this beautiful nation. Once you've reenacted the forest scenes, jump back in the campervan and head to Rivendell. Kaitoke National Park, north of Upper Hutt and Wellington, is the home of Arwen and her palace, Rivendell. 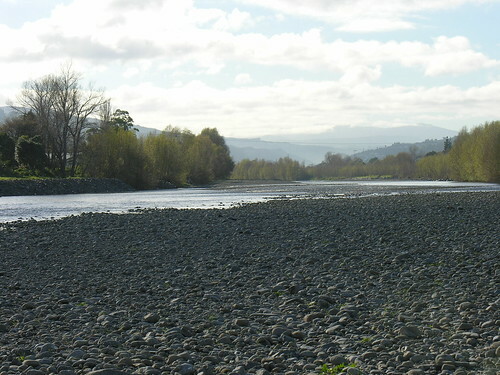 Nearby, the Hutt River, acted as the Great River (from Moonshine Bridge to Poets Park) and Harcourt Park in Upper Hutt was the setting for Isengard gardens. Lower Hutt also holds hidden middle Earth characteristics. The Dry Creek Quarry on Hayward's Hill Road was the setting for Helm's Deep, from The Two Tower's battle scene. 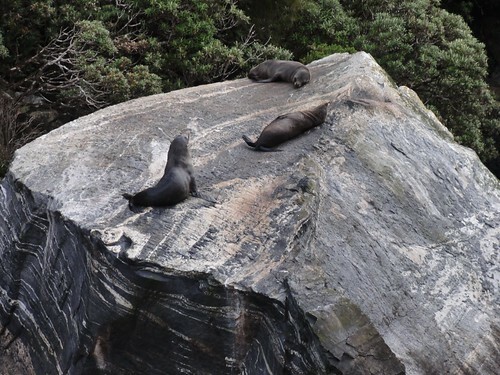 Get 40 winks somewhere and drive the Campervan onto the Cook Strait Ferry to head to Nelson. Once you've docked in Picton, sailing through the beautiful Queen Charlotte Sound, it's a almost 4 hour drive to Mount Olympus or a 2 1/2 hour drive to Mount Owen where you may recognise scenes of Dimrill Dale, Eregion Hills and the countyside south of Rivendell. Nelson helicopters can take you on a birds eye view flight of the locations! On you way to Mount Olympus take a stop at Takaka Hill- the location of Chetwood forest and the initial route taken by the Hobbits and Strider. 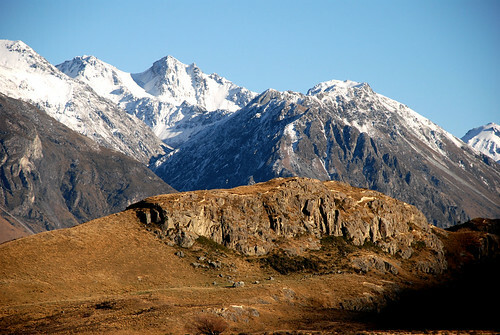 Approximately a 7 1/2 hour drive from Nelson is the next destination, so spend a night somewhere on the way and possibly stop in at Mount Sunday, the location of Edoras. 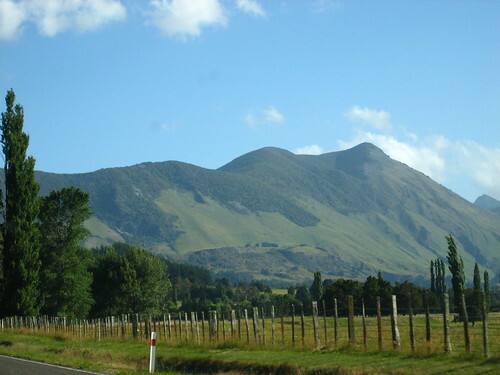 In the Ashburton area of Canterbury is Mount Potts. In the middle of an expansive plain is a sheer-sided hill that seems purposely built for LOTR. Surrounded by ice and mountains of rock, this location astounded all the crew and cast. After you've left Mount Potts, head to Twizel. It was here that the opening scenes of the Two Towers were filmed. Ben Ohau station, a working high country sheep station, became the location for many a scene and battle. Descend once again further south to a small farming town of Tarras. It was here on the banks of the Clutha River that uninterrupted views of snowy mountains made the perfect location to film the Black Riders chasing Frodo, orc attacks and Arwen and Frodo galloping through the trees. If you gaze at the mountains behind Lake Wanaka, you may recognise the Misty Mountains and the backdrop of Gandalf's rescue from the tower of Orthanc. Stay for a bit in Wanaka and enjoy the bars, restaurants and great hospitality. If you think the tour's over, think again. Head south to Queenstown. A spectacular drive through beautiful scenery will lead you to Lothlorien and many other locations. Lake Whakatipu was used as Lothlorien, the river Kawarau was also the Great River Anduin (where you can float past in a raft), the hilltop of Deer Park Heights was used in all films and the snowcapped 'Remarkables' mountains doubled as slopes of Dimrill Dale. A short drive from Queenstown lies Skippers Canyon, where Liv Tyler (Arwen) had her most dramatic scene - her confrontation with the threatening Black Riders. Heliworks and Glenorchy Air takes fans on flights to view many of the dramatic scenes in the Glenorchy region. We bring the tour to an end in Te Anau. 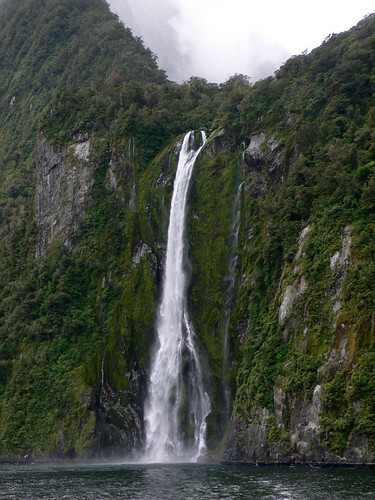 This small town is the gateway to the spectacular Fiordland national Park and the base for many 'Two Towers' locations. The wetlands, moss covered rainforest and the Waiau River became Anduin for the films. The bushy Kepler mountains above the depths of Lake Te Anau, provided another spectacular location. If you don't mind offroading it for a while, you can reach the remote and extremely tranquil location that that was Fangorn Forrest and Nen Hithoel. But surely this would be worth the 39km gravel road off the main Te Anau highway. Frodo and Sam leave fellowship and cross River. If you're stopping for a brew in your journey through Middle Earth, be sure to look out for Harrington's Breweries beers. Nelson artisans crafted the One Ring beer that was served in the Prancing Pony in the village of Bree and in Hobbiton. Take your time doing the journey and have some good rests so you can get back to full strength and keep chasing the ring. Find a Campervan for your journey at Motorhome Republic. Enjoy Middle Earth!! Winter in New Zealand is approaching, and the South Island is getting ready to be the most beautiful place in the world once again! At the foot of freshly snow covered mountains are the most pristine transparent lakes shored by smooth round rocks. The roads are bordered with Paddocks of sheep or you can drive through spectacular valleys. Take a Campervan through the South Island of this beautiful country New Zealand and let the roads take you where they want you to go. Depending on how much time you've got, you can decide how much time you'll spend in each place, but you'll wish you had weeks. Go skiiing or snowboarding or just relax in your Campervan among beautiful vistas with a hot coffee. Fly or drive to Christchurch and begin your winter sightsee and adventure holiday. 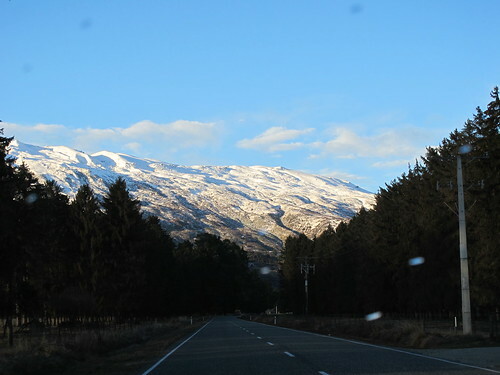 Pick up your Campervan in Christchurch, explore the surrounding area of Christchurch or get on the road to Lake Tekapo. 225 km out of Christchurch and through quaint Cantabrian towns like Ashburton you'll find the most tranquil, serene place in NZ. Step out of the Campervan and your ears will ring because it's so peaceful. The lake is so still the reflection of the background snowcapped mountains will astound you. Feel as if you've walked into a photograph when you spot the pretty stone church aside the lake. Lake Tekapo Camping - Lake Tekapo Motel's and Holiday Park. When you're ready to get back on the road, head for Queenstown. A three hour journey passing through beautiful landscapes will lead you to the world famous city. Sit alongside the lake watching the Earnslaw boat come and go, jump on the Earnslaw and go over to Glenorchy or use this as a base for snowboarding/skiing Coronet Peak or The Remarkables (which truly are remarkable). The lovely town is filled with cobbled streets, fine restaurants and cafes and good shopping. Once you've had your fill of Queenstown (if it's possible) head over the Crown Range for Wanaka. But before you do stop in at the quaint gold mining town, Arrowtown. Once over the range, if you're game, go for a ski or snowboard up Cardrona or for the tricksters, Snowpark. Both are fantastic riding experiences. In Wanaka, sit back in one of the cosy bars with a mulled wine or snuggle up lakeside in the Campervan. Take a drive to Lake Hawea on your way to Fox or Franz Josef Glacier. 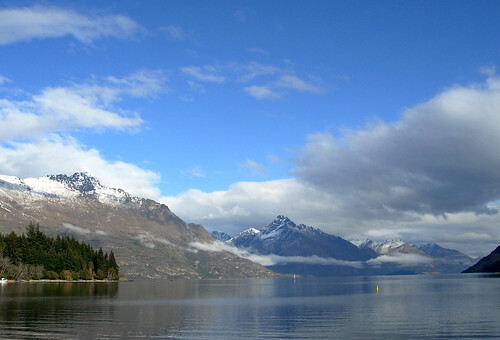 Lake Hawea is yet another example of picture perfect New Zealand Lakes and Mountain. 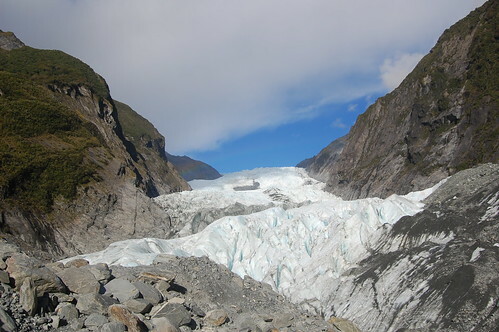 Be awed by the glaciers Franz Josef and Fox but be careful of the Kea birds. They may try investigate your camper and belongings. 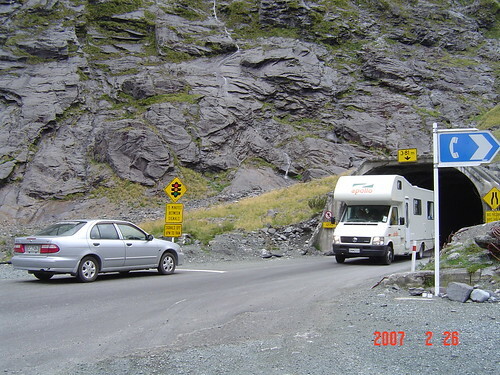 Franz Josef Campervan Park - Rain Forrest Holiday Park. Drive back to Christchurch through the spectacular Arthur's pass or take a longer journey up to Greymouth and through Hamner Springs. Hamner springs will welcome you with hot water to soak in amongst the snowy trees and mountains around you. If you want a more extended trip, add these towns on to the beginning, middle or end of your journey. Manapouri (post Queenstown) - The Fjordlands will definitely impress. Bluff (post Queenstown) - Try some famous Bluff Oysters. Yum! Change the pick up and drop off point of your Campervan. Find a Campervan depot location at Motorhome Republic. Whether you're from New Zealand or overseas, this trip is a must do for any body young and old. 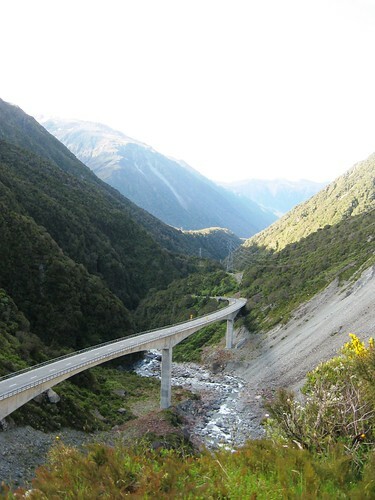 Not only will you experience spectacular scenery but also the friendliness and hospitality of Southland. If you'd prefer to do this route or another route by car, find a rental car at Car Rental Republic.